October is free SEO month! October is free SEO month! The HOATown Support team is offering free Search Engine Optimization services for all our valued customers. We will start by submitting your site to the major search engines and making some optimization in the code of your site. We will also make specific suggestions on how to increase your HOA site’s visibility in the search engines. Send us an SEO request and the HOATown Support team will get to work on making your HOA website more search engine friendly. 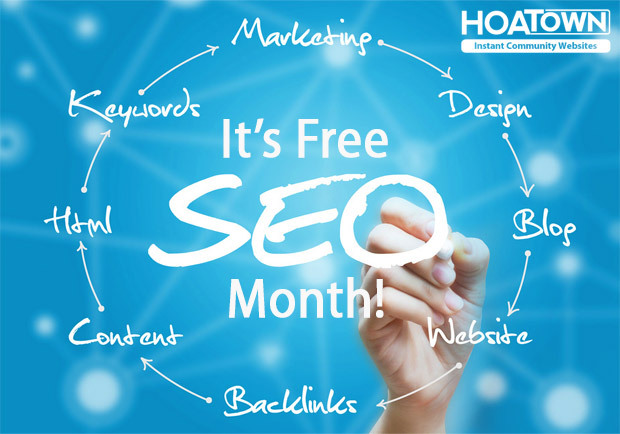 Posted on Sep 30, 2014 in Blog	by hoa-admin	Comments Off on October is free SEO month! HOATown Version 3.0 represents the latest and greatest evolution in community communication and information management. Our all new and improved software provides you with the most functional and flexible community website on the market. As we enter our sixth year of outstanding service, we are thrilled to make our highly acclaimed offering Even Better! Now you can enjoy dozens of new features, including improved website design, lightning fast page loading, enhanced site customization tools, four new modules, optional internal email for members, and available Online Property Pay powered by Revo Payments. All this and more…from just $30.00/month!